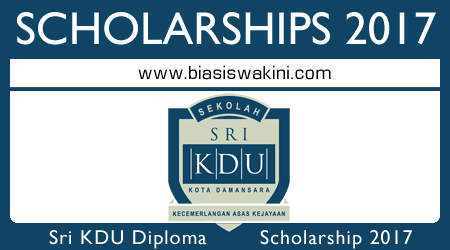 Sri KDU is offering the International Baccalaureate Diploma Programme Scholarship Award for 2017. Sri KDU® International School is an authorised school of the International Baccalaureate Organisation (IB World School). The School offers the International Baccalaureate Diploma Programme at its school campus in Kota Damansara, Selangor Darul Ehsan, Malaysia. The International Baccalaureate Diploma Programme is a demanding pre-university course of study that gives holders access to the world’s leading universities. It is a comprehensive two-year international curriculum. Students of the programme share an academic experience that emphasizes critical thinking, intercultural understanding and exposure to a variety of points of view. Students are accepted into the Diploma Programme at Sri KDU® in September each year. The scholarship opens from 16th January 2017 to 30th March 2017. You may access the scholarship form from the this link. 0 Komentar untuk "Sri KDU International Baccalaureate Diploma Programme Scholarship Award 2017"